Erick Kaglan, photographed at the White House during the Young African Leaders Forum. Editor's note: Erick Kaglan is a Togolese journalist who works as Head of English Desk with the Togo-based Savoir News Agency. 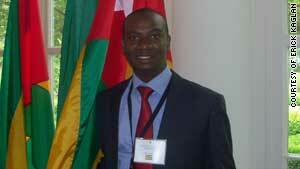 He represented his country at President Obama's Young African Leaders Forum held August 3 - 5, in Washington DC. 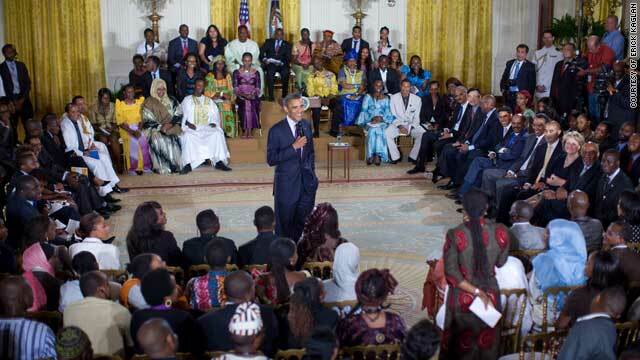 He was among 115 future African leaders chosen to take part in the United States' celebrations of 50 years of independence in 17 African countries this year. Lome, Togo (CNN) -- Fifty years after its independence, my country Togo is still lagging behind many of its peers in the West Africa sub-region. With no adequate road infrastructure, poor health facilities, poor education and rising unemployment, the young of Togo seem to have lost all sense of patriotism and hope. As the press plays a central role in any democracy, I see my invitation to President Obama's Young African Leaders Forum, which took place in Washington DC last week, as an excellent opportunity for me to contribute to the restoration of Togo. Although, our long journey to democracy has not been easy, we have achieved a lot in the areas of press freedom and freedom of expression. However, there is still much room for improvement. Our elections are yet to be free, fair and transparent. Our accountability system needs to be more rigorous; our judicial system needs to be accessible and equal for all citizens. As President Obama said on his visit to Accra, Ghana last year, it's the young "brimming with talent and energy" like me "who will determine Africa's future". "It will be up to you, young people full of talent and imagination, to build the Africa for the next 50 years", he told us during the town-hall meeting last week. "You represent the Africa that so often is overlooked -- the great progress that many Africans have achieved and the unlimited potential that you've got going forward into the 21st century," he added. President Obama's forum was also an excellent opportunity to learn from other fellow young leaders about what they have been doing on the continent in terms of creating jobs, fighting corruption, protecting the rights of people, promoting education and fostering peace. I was particularly inspired by one fellow journalist from Ivory Coast, Assale Tiemoko, who was imprisoned for one year in the capital Abidjan over an article he wrote about corruption in his country. Another "new friend" is Miguil Hasan-Farah from Djibouti, a small republic in the Horn of Africa, who began selling ice cream and now runs his own accounting practice and advises other young entrepreneurs. This forum was an awakening of conscience. Learning from the other fellows was great. Listening to President Obama's encouraging words at the White House was greater. "The United States wants to be your partner. We are rooting for your success and we want to work with you to achieve that success", he told us. As young leaders, you hold your continent's future in your hands. "America wants to support your aspirations. If you keep dreaming and keep working and keep learning and don't give up, then I'm confident that your countries and the entire continent and the entire world will be better for it," the President added. I was also thrilled and felt very encouraged by President Obama's word as I received, like other fellows of Africa, a present and a letter from the president, while making our way out of the White House. In his letter, he wrote: "This event serves as an acknowledgment of Africa's rich history and tremendous potential, and a celebration of its uniquely youthful demographics. As young leaders, you hold your continent's future in your hands -- you will shape public policy, drive private sector growth, and mobilize civic engagement to transform African communities and nations." "The United States wants to be a strong partner in helping realize the vision of a peaceful, prosperous, and dynamic Africa in the decades ahead." After reading this letter, I felt the world's most powerful leader gave me an assignment, because he believes in me. I feel comforted by his words as he promises to help us succeed. I also know that I can count on other U.S. top officials like Secretary of State Hillary Clinton, and others in charge of African affairs in the administration, like Johnnie Carson and Bruce Wharton, but above all, the young and dynamic people of Togo.